Clifford Smith (born April 1, 1971 in Staten Island, New York), better known by his stage name Method Man or Meth is an American hip hop artist, record producer, actor and member of the hip hop collective Wu-Tang Clan. 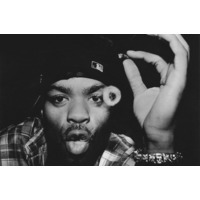 He took his stage name from the 1979 film The Fearless Young Boxer, also known as Method Man. He is one half of the rap duo Method Man & Redman along with fellow rapper Redman. He won a Grammy for Best Rap Performance by a Duo or Group for "I'll Be There for You/You're All I Need to Get By" with Mary J. Blige. He appeared in the motion pictures Belly, How High, Garden State as well as a minor role in The Wackness. On television, he and hip-hop collaborator Redman co-starred on the short-lived Fox sitcom Method & Red, and he had a recurring role as Calvin "Cheese" Wagstaff on the acclaimed HBO drama series The Wire.